Do you love your iPad 2, but still like using pen and paper for writing? If so, check out the BooqPad! The BooqPad is anything but your typical iPad 2 folio-style case. It features a built-in notepad and pen holder for sketching, taking notes, or writing papers. The pen holder in the center of the case is great for holding your favorite pen without scratching your iPad. You can order several different types of paper for the BooqPad from Booq’s website. For instance, you can choose from graph paper, lined paper or a simple blank sheet notebook. The paper packs are available for $10, and each pack comes with three packs of fifty sheets. Unfortunately your own standard notebook will most likely not fit the BooqPad due to the custom opening size. This case is available in five neutral colors. You have the option of buying this case in a recycled PET material, or genuine leather, though it doubles the cost. 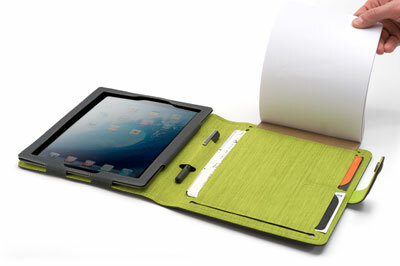 This case is a perfect fit for students that still need pen and paper, but want the iPad experience too. Like when you need to read your digital textbook on the iPad while simultaneously taking test notes on a regular notepad. This case will run you $49 for a standard case and $99 for a genuine leather case. While this seem expensive to some, it’s a good choice for anyone who likes the iPad but still needs old fashioned pen and paper.